If you have an iOS device like an iPhone or iPad, there is a great app from AT&T called the “AT&T Code Scanner”. Use your iOS device to scan QR, Datamatrix, EAN, or UPC codes. All these codes can be created with Sunset Reports. In a recent article by Sam Laird titled “In a Relationship: Mobile Apps and the Cloud“, the author points out the connection between mobile devices and the cloud. In recent posts we spoke about how this relationship works with our software. Getting reports from Sunset Reports is a simple process that we have spoke about several times and offered several methods to do it, from emails, texts, and cloud services. Capturing data on a mobile device and getting that data into a database that Sunset Reports can connect to is a different topic. Client software on a mobile device exists to do just that. There are a few business database applications for the iPad, but here we want to focus on those that will “sync” to a cloud server in the true sense of the word. The app needs to handle the situation where it is not online all the time. If you go to the app store and search for “database sync” you will only find one product in the “business” category, and that app is called “Cellica Database”. In future posts, we will explore this app and how to use it in conjuction with our product. A recent article titled “Cloud, iPad, and the end of the geek era” published on TechRepublic hits home for a lot of IT professionals. The future is not about relying on the IT department. Most people that need to get their work done, are doing it themselves. 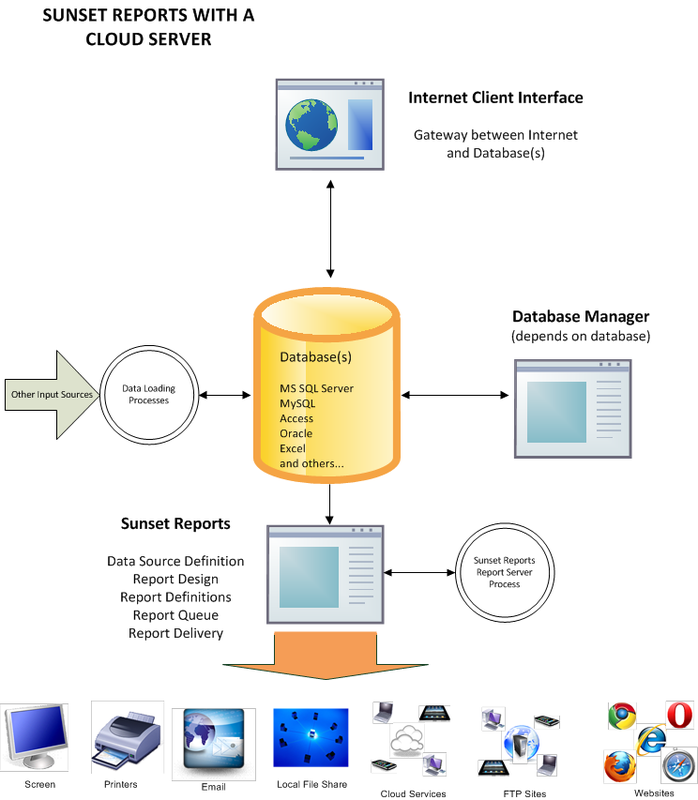 That is why a product like Sunset Reports is a good choice for users who need to create reports from corporate data. Recent posts here show how Sunset Reports integrates with the Cloud and the iPhone/iPad and also talk more about the IT department. This website has a special viewing feature when viewed on an iPad. Don’t forget to click on the Menu button on the top right to see a submenu with all the pages available as well as the most popular categories. You can always click on the bottom and view the site in the standard format. A great way to remotely get access to the reports created by Sunset Reports is to use a cloud service. You have many choices including Dropbox, iCloud, SkyDrive, Google Drive, CX.com, SugarSync, among others. If you are nervous about security with sensitive reports, use the password protection on an encrypted PDF file to be safe. Our recommendation is SkyDrive, although the others work too. Set your report repository to a folder within your local Skydrive folder on your workstation or server. As soon as the report is saved, it is available on your Skydrive devices including other PC’s, your iPad, your iPhone, etc. It cannot be easier or more simple.